Comfort fit for Workouts - Your ultimate comfortable choice for wireless music and calls when training. Water Proof - Designed to withstand the most intensive workout conditions. So go ahead, move, sweat and rock hard. aptX Technology - Delivers CD-quality wirelessly over Bluetooth. Dual Microphones - Dual, high-performance mics deliver superb noice cancellation, so calls come in crystal clear. NFC for Quick Connection - Quickly and easy pairing and connection throught the in-built NFC. Sealed design of the PSYC Elise SX black sports earphones provide sweat and water resistant properties. Designed to withstand shock from heavy motions with ergonomically designed earpiece. Use it for jogging, hiking, gym, cycling or any other sports. 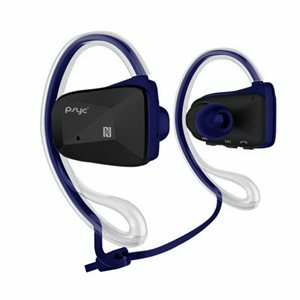 Utilising Bluetooth 4.0 and apTX technology the PSYC Elise SX provides near CD audio quality during work outs. Dual microphones ensure clear communication when making calls to other people.